Home Tips	60% Off Zazzle.com! Happy Wednesday! I’m dying to share with you that today only Zazzle is having a 60% off sale on all invitations, stickers, tags, etc. Come see what I’m ordering! With my son’s wedding quickly approaching (3 months and 16 days) I’m getting really excited about the BIG day! As parents of the groom, my husband and I will be planning and hosting the rehearsal dinner. So I’ve been looking for some invitations and rsvp cards. I still haven’t decided which ones to choose, but I am ordering some stickers and tags for the favors. And today Zazzle.com has 60% off so it’s the perfect time to order! Today Zazzle.com has 60% off of all invitations, stickers, cards, tags, ornaments and more. Use Code: SUMMERTIME60 at checkout and you’ll save big! And everything else site wide is 20% off. I love that everything can be customized too. I ordered the invitations for the engagement party through Zazzle and was very pleased with how they turned out. I also ordered some pretty round stickers with the letter “B” as envelope seals. Since the stickers are 60% off today, I think I’ll order more! For the rehearsal dinner I’m ordering some tags to put on the party favors for each guest. I haven’t decided what to give as a gift yet, but I like these tags from Zazzle. Wouldn’t these look pretty on a gift box or bottle of champagne? On the Zazzle website you can customize each item and see what it looks like before you place your order. I was playing around with the tags and came up with this one for the shower. We are actually doing something different but I love how the pink and gold looks along with the fancy script. 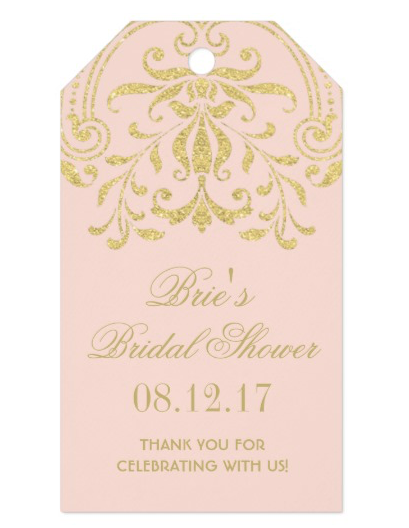 Of course most of the tags come in multiple colors and you can choose your wording so you could make this one into a tag for a wedding, shower, thank you tag, etc. I wish Zazzle offered to address the envelopes like Minted. Because of this, I’ll order the rehearsal dinner invitations from Minted.com. But I’m definitely ordering the napkins, stickers and tags today from Zazzle! Who can pass up this deal? I told my sister about the sale this morning and she ordered some custom stickers for herself and saved $35 on her order! Yay! So, I’m happy to pass along the savings to you too! My sister ordered custom stamps for the bridal shower through Zazzle, too. Aren’t they beautiful?